Hi my name is Rodrigo Osorio founding member of Cryptos Tabasco a blockchain community in México, we been working for 4 years organizing meet ups, events, airdrops and many other events about blockchain technology and the benefits of this digital economy. Organize 2 meet ups with local businesses about 30 person per event with a talk about smartcash and the newest smartcard solution, so they can learn about cryptocurrency and the new economy toward and ecosystem, do some workshops and be able to connect with businesses and Smart Cash technology and the costumer could spend at the local business generating an interaction between consumers and merchants. Build a workshop for developers previously selected and incentivize them to learn more about this technology and his code, and the tools to recognize the reach of each one. Evangelize the sellers and buyers improving the advantages of digital cash. Find talent to the devs that could contribute with more elaborated projects thanks to the dev team. Once the event is finalize we could have a good sense of the ecosystem and a adoption opportunities in the region. Find innovative solutions for the different industries and new opportunities and business models. We are looking or technical competent people that can generate enough value to produce possible smartnodes and can take advantage of the SmartCash technology. We are looking for people between the ages of 30-45 with some years in the IT field and disposable cash to fund smartnodes. We are the first and only blockchain community with experience in the region and we want that there is a proper adoption. 200 usd for coffee break? Is it just coffee or are other refreshments provided? What type of marketing do you plan on doing? The total for projected outreach is $3000/60 = $50 per person. Villa Hermosa is the capital of Tabasco (Mexico) and has one of the most active crypto community "Cryptos Tabasco". 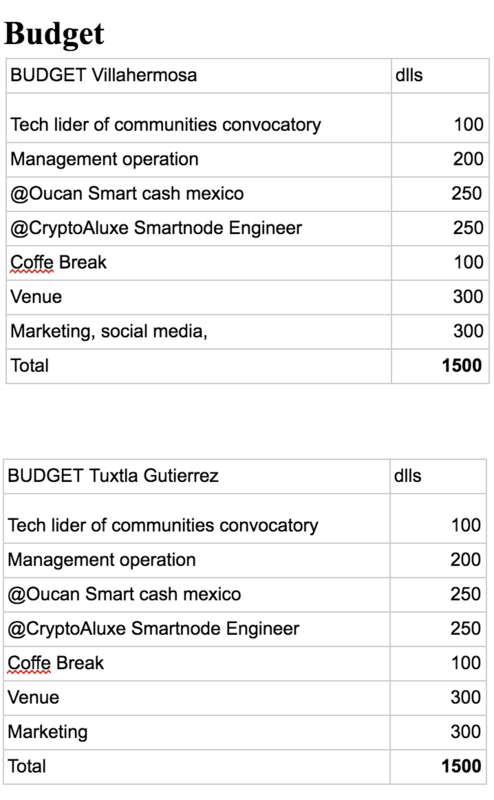 I did a first SmartCash talk in Villahermosa in february and I was impressed with all thecommunity activity, also reaching Tuxtla Gutierrez the capital of Chiapas is great for SmartCash adoption growth (lot of tourism in Chiapas) and a new SmartCash community there would be excellent. This looks like a great option for know more about Smartcash and know how we can be part of this, and give support. Normally here in Villahermosa this kind of events never happens, and now I think is a good oportunitiy for us know about this from the guide from experts. Bravo for this initiative. i just want you to know that the word "coffe break" its not just coffe is something like this https://bit.ly/2A8txTx thanks!!! Hi! Your proposal is simple, but direct in order to bring people the necessary information about SmartCash. Send some pictures and videos during the meetups. I like your proposal! Good luck!